Drawn in the year of Argentina's independence from Spain, 1850. 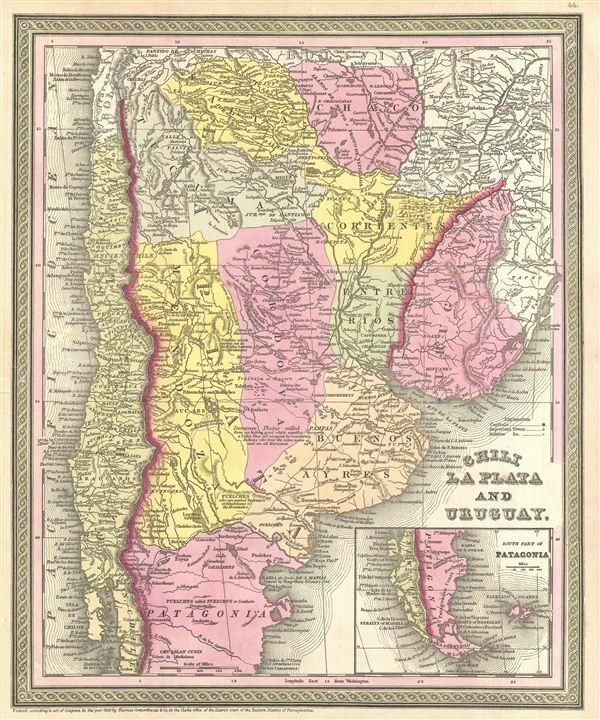 A fine example of Thomas Cowperthwait and S. A. Mitchell's 1854 map of Chile, Argentina (La Plata) and Uruguay. The whole is engraved and colored in Mitchell's distinctive style with green border work and vivid pastels. Political and topographical features are noted and color coded with elevation rendered by hachure. Aconcagua, Chuapa, Santiago, and a number of other Andes volcanoes are noted. This map drawn in 1850, the year of Argentina's independence from Spain. Following General Jose de an Martin's defeat of the Royalist forces and the subsequent liberation of Argentina, European and other Latin American settlers flocked to the region with dreams of rich farm lands and other natural wealth. Rumsey 0537.043 (1846 edition). Phillips (Atlases) 814.